If your weekends are usually filled with trucks and Jeeps playing in the mud and bouncing off rocks, then you've found the right page. Skyjacker knows off-roading, and Skyjacker Nitro 8000 shocks are necessary for any vehicle going off the beaten path. Nitro 8000 shocks feature a nitrogen gas filled chamber that is pressurized to 150 PSI. Multi-stage velocity sensitive valving creates an immediate response, meaning a more comfortable and stable ride. Each Skyjacker shock features twin tube construction, along with an over-sized piston head with a 14mm piston rod. All Nitro 8000 shocks include the patented Skyjacker red boot, so everybody will know who you're rocking. The wild world of rocks and mud is calling. Answer the call and be prepared with Skyjacker Nitro 8000 shocks. 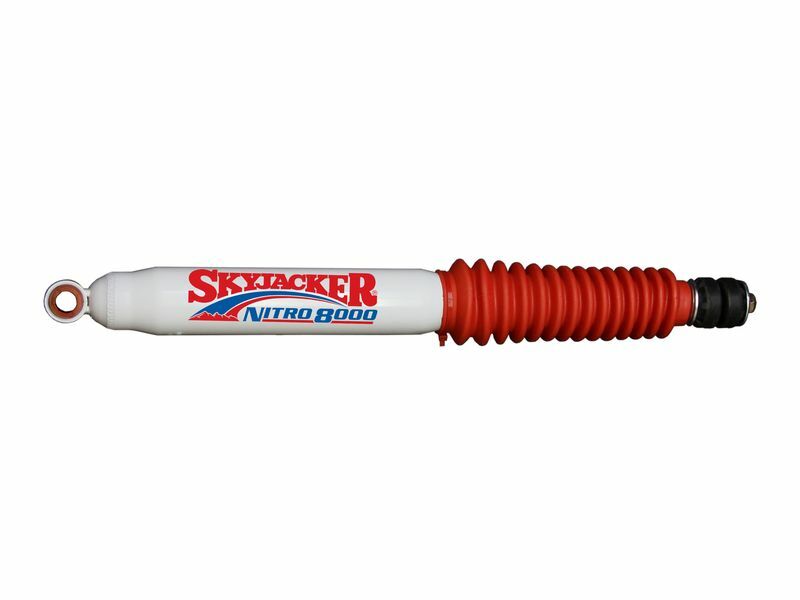 Skyjacker Nitro 8000 shocks offer an easy installation that can be done right in your garage. Each order comes with all the necessary hardware, and the installation instructions. If you have any questions, please give us a call at 877-216-5446.